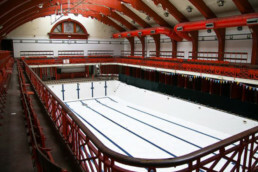 Govanhill Baths is Glasgow’s last surviving Edwardian public bathhouse. The building originally contained public baths, a wash house, three swimming pools and a Turkish baths suite. The wash house, at the rear of the building, was converted to a laundrette in 1971. Closed in 2001, there has been a continual campaign ever since to save the building and re-open it for community benefit with swimming and other health related facilities. Currently the building hosts swimming lessons in the Learner pool and community health, wellbeing and arts activities in the rest of the building. The foundation stone for the baths and wash-house was laid on 3 July 1914 by the Lord Provost of Glasgow, Sir Daniel Macaulay. An important function of the building in the early years was to provide clothes-washing facilities and baths for local people whose tenement homes typically had no such facilities. Local rumour has it that the baths were used as a temporary mortuary for casualties from bombing during World War II. Restoration will cost over £6million and around £5million has already been secured. 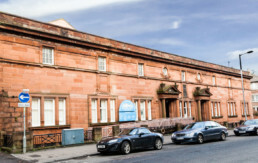 Once restored Govanhill Baths will become a Wellbeing Centre with two pools and the Turkish Baths Suite open to the public, multi functional arts space and community rooms.